The components that you will need include single-strand solid-core wire, an Arduino Uno board and various electronic parts listed in this article. If your breadboard was not supplied with wire links, you will need to obtain some single-strand plastic insulated wire (with a solid single core, not multi-stranded). You may need extra wire even if you do have a box of wire links. Preferably the wire will have different coloured insulation, e.g. red, black, blue, yellow, etc. Arduino is an open-source project for learning about microcontrollers and programming. Arduino consists of a hardware platform (a circuit board) and a free open-source programming environment used to program the circuit board (a program that runs on the PC). As a beginner, you will build circuits on a breadboard and connect them to the Arduino board. A program will then be loaded to the Arduino board from a PC via a USB cable. The program running on the Arduino board will operate the connected circuit - e.g. it will flash a light on and off, play a tune and more. There is more than one type of Arduino board. The beginner's tutorials use the entry-level Arduino board called the Arduino Uno. You will need a standard USB cable (not the one with miniature connector) to connect the Arduino board to a PC. Different electronic parts will be needed for each project. Each project will have a parts list. At the end of this article there will be a shopping list that contains the parts that you will need for the projects (tutorials). Every circuit needs a power source. Stand alone circuits will be powered by a battery. Circuits interfaced to the Arduino Uno board will be powered from the Arduino Uno which receives its power from a PC's USB port. 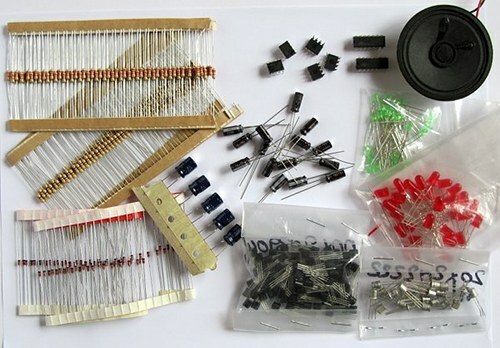 The next part of this article contains a shopping list of electronic parts that you will need to get started with the tutorials.